Singapore — Crude oil futures were stable to higher during mid-morning trade in Asia Tuesday, with the Brent futures contract largely unchanged on the back of stable production data from Russia and the NYMEX WTI contract edging higher ahead of the release of weekly US inventory reports. At 10:30 am Singapore time (0230 GMT), ICE November Brent crude futures were down a marginal 3 cents/b (0.04%) from Monday’s settle at $78.12/b, while the NYMEX October light sweet crude contract was 26 cents/b (0.37%) higher than Friday’s settle at $70.06/b. The US market was closed Monday for Labor Day. “WTI appears to be catching up with Brent’s climb on Monday while the US markets were closed,” said Vandana Hari, founder Vanda Insights. “Brent appears to be taking a pause this morning after touching three-month highs,” she added. Russia’s crude and condensate production averaged 11.21 million b/d in August, dipping 8,000 b/d from July, when the country cranked up production significantly, according to preliminary data released Sunday by the Central Dispatching Unit, the energy ministry’s statistics arm. Russia started raising oil output in June after the the OPEC/non-OPEC coalition agreed to ease production caps in effect since 2017. Russia’s production in August was estimated at 253,000 b/d above the level envisaged under the initial production cut deal, energy minister Alexander Novak said Monday. “In September, the output is expected at the level of July, August,” Novak was quoted as saying by Prime news agency. “Russia is also unable to significantly expand its production which, following an increase in the summer, is now close to its post-Soviet record high,” said Commerzbank analysts in a note. “It therefore remains unclear whether OPEC will be able to absorb a potentially massive fall in Iranian oil exports due to the US sanctions,” they added. Meanwhile, NYMEX WTI prices were trading slightly higher during the Asian morning session ahead of the release of weekly US crude inventory data, which will be delayed this week by the Labor Day holiday. The larger-than-expected draw in US crude inventories for the week ended August 24 has been keeping prices supported, analysts said. Preliminary reports on last week’s US crude inventory levels are due for release by the American Petroleum Institute on Wednesday and the more definitive numbers by the US Energy Information Administration on Thursday. Elsewhere, analysts from BNP Paribas have lowered their forecasts for oil prices for the rest of the year in light of stable demand-supply expectations. “We do not expect oil demand to be materially impacted in the next 6-9 months by economic uncertainty linked to US/China trade tensions and recent concerns over emerging markets,” said Harry Tchilinguirian, senior oil strategist at BNP Paribas. On the impact of the loss of Iranian crude barrels in the market as a result of the US sanctions, Tchilinguirian said that although an initial supply gap was likely to emerge, given average inventory levels in the OECD, the oil market was expected to resolve the supply gap through higher prices. “We see WTI averaging $68/b in 2018 and Brent at $74/b. In 2019, we see WTI averaging $74/b and Brent at $79/b,” Tchilinguirian added. Market participants were also watching Tuesday for developments in the US-China trade war, with the US expected to announce another round of tariffs on Chinese goods. “We might see renewed downward pressure on crude later this week if the US goes ahead with imposing tariffs on $200 billion worth of Chinese imports,” Hari said. As of 0230 GMT, the US Dollar Index was up 0.12% at 95.185. This entry was tagged Asia, Brent futures, crude oil futures, Russia's crude, WTI. Bookmark the permalink. SINGAPORE (Reuters) – Surveying the ocean floor for oil and natural gas reserves is gradually emerging from a multi-year slump, everywhere apart from Asia. That’s despite Asia being the world’s biggest consumer of oil, having by far the strongest demand growth while seeing its production fall faster than anywhere else. The reasons for Asia’s dearth in offshore exploration and production (E&P) include high costs in Australia’s promising waters, declining reserves in production hotspots Malaysia and Indonesia, as well as territorial disputes in the oil- and gas-rich waters of the South China Sea. 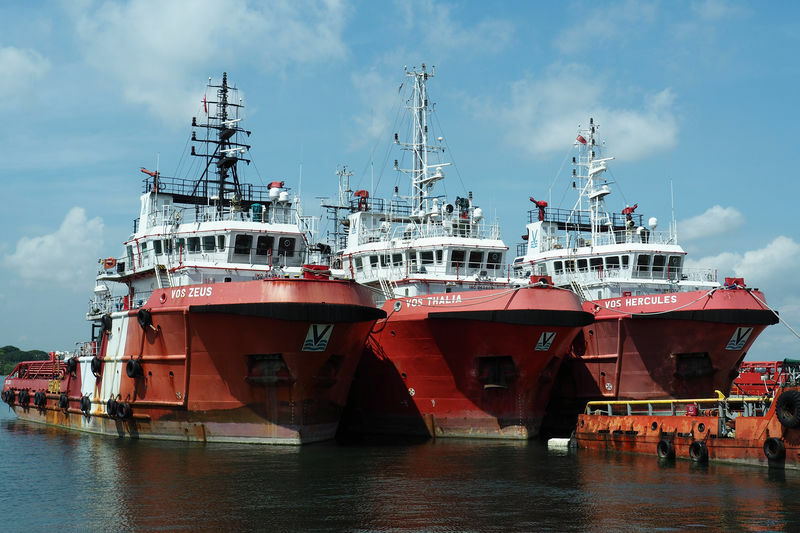 “We only have two 3D vessels in Asia-Pacific, since there are fewer opportunities and less activity in that region,” said Bard Stenberg, vice president at Norwegian offshore survey company PGS, adding that most of his company’s vessels were in the Atlantic. A 2017 and 2018 activity map by geophysical surveillance firm TGS shows the most activity in the North Atlantic. A similar map by Bernstein Research showed the Asia-Pacific basin to have only four minor offshore developments of under 50,000 barrels per day (bpd). That compares to five major developments (above 50,000 bpd) and 11 minor ones in the Atlantic. Asia’s dearth comes despite the region’s huge oil deficit, resulting from booming demand and declining output. In one of the most promising regions, Australia, the main problem is cost, in part due to a requirement for rigs to pay for Australian crew once in Australian waters. “Once any foreign-flagged vessel is in Australian waters, the ship operator has to pick up Australian workers… They work 12 hours a day, 7 days a week for 4 weeks, then get 4 weeks off,” said Christy Cain of the Maritime Union of Australia. When oil prices were high, this was not a big problem, drillers said. But in times of cheaper oil and low profit margins, the added cost deters explorers, several said. In another promising area, the South China Sea, conflicting territorial claims, especially between China and Vietnam, have hindered E&P activity. Meanwhile, in Asia’s most established offshore oil and gas production basins of Malaysia and Indonesia, recoverable reserves are depleting. Malaysia’s state-owned Petronas, Southeast Asia’s biggest oil producer, is increasingly focusing on downstream projects like the Pengerang Integrated Complex (PIC) in the southern state of Johor. From 2019, PIC will refine crude oil into fuel and petrochemical products. Significant amounts of its crude will come from Saudi Arabia. With little E&P activity, Asia’s oil import bill – which has already more than doubled since 2000 to over $420 billion a year – will rise further, likely above $500 billion in 2017, leaving other regions to cash in on Asia’s oil thirst. Gauging the health of the secretive offshore industry is difficult. But dozens of mothballed rigs and support vessels sit idle in southern Malaysia’s Johor river delta, waiting to be used or scrapped. Yet cautious optimism is emerging. “Activity to support new development projects may increase slightly (between 2018 and 2020), but is unlikely to approach historical high levels (2013/14),” Petronas said in an outlook this month. Douglas Westwood, which monitors helicopter activity to and from offshore vessels, has a similar view. “The offshore helicopter market has finally started to recover following three years of decline,” Westwood said, although it added that average annual growth between 2018 and 2022 will still only be 1 percent. “Global utilization will average 59 percent over the forecast,” it said, up from a paltry 54 percent in 2017. At the root of the industry malaise lies rampant overproduction in the years running up to 2014, which crashed crude prices from over $100 per barrel in 2014 to below $30 in 2016. E&P companies were among the first to feel the bite of aggressive industry cost slashing. Firms in the seismic oil surveillance sector, including Polarcus, PGS, and Electromagnetic Geoservices have seen their share prices crash since 2015, in some cases by over 90 percent. Only a production cut led by the Organization of the Petroleum Exporting Countries (OPEC) has stabilized Brent above $50 a barrel since mid-2017. With oil demand healthy, the offshore industry hopes companies will start spending on future output again. “We’re hoping that it’s going to pick up next year,” said Cain of the Maritime Union of Australia. In a sign that even in Asia-Pacific there may be some more activity, the geothermal surveillance ship Polarcus Naila left Singapore in early December for a seismic mission in the Bonaparte Basin, off Australia’s northwest coast. This entry was tagged Asia, Brent, natural gas, offshore oil searches, Oil and Gas. Bookmark the permalink. LAUNCESTON, Australia, Nov 13 (Reuters) – U.S. crude oil is flooding into Asia, and may continue to do so as the arbitrage window that was initially created by Hurricane Harvey remains open, even though the disruption from the costliest storm to hit the Gulf of Mexico has faded.A record amount of U.S. crude is scheduled to arrive in Asia in November, according to vessel-tracking and port data compiled by Thomson Reuters Oil Research and Forecasts. The data show 19.7 million barrels of U.S. oil is due to arrive across Asia in November, equivalent to about 657,000 barrels per day (bpd). The data are filtered to show only vessels that are currently underway, and those that are discharging or have discharged their cargoes. This is more than a 50 percent jump on the 427,000 bpd that was offloaded in Asia in October, and also above the previous record-high month for U.S. crude shipments to Asia of 541,000 bpd from June. It also appears that December will be another month of strength, with 11 vessels carrying a combined 16.5 million barrels of crude already en route from U.S. Gulf ports to Asia. When Hurricane Harvey struck the U.S. Gulf coast in late August one of the initial impacts was a drop in the price of West Texas Intermediate (WTI), the main U.S. light crude grade. At that time it became likely that U.S. exports to Asia would ramp up given that WTI’s discount to the global benchmark light crude, Brent, widened to $5.46 a barrel at closing prices on Aug. 29. This was enough of a gap to overcome the higher freight rate to ship from the Gulf coast to Asia, compared to similar grades of crude from African producers such as Angola and Nigeria. WTI’s discount to Brent had been just $2.48 a barrel at the end of July, which made it harder to make a profit shipping U.S. crude to Asia. But instead of narrowing back as refineries recovered along the U.S. Gulf coast after Harvey and started processing crude again, WTI’s discount to Brent has remained at elevated levels. At the close of Nov. 10, Brent commanded a $6.78 premium over WTI, which is even higher than what it was in the immediate aftermath of Harvey. This makes it likely that U.S. crude will continue to flow to Asia at robust levels, as the discount provides a profitable trade for U.S. shale drillers and other oil producers. While the volumes aren’t enough to threaten the position of Asia’s major suppliers, such as OPEC heavyweights Saudi Arabia, Iran and Iraq, as well as Russia, it is enough to complicate the efforts of OPEC and its allies to re-balance crude oil markets and send prices sustainably higher. For example, China, the world’s top crude importer, has been ramping up purchases from the United States, taking the equivalent of about 127,000 bpd of U.S. crude in the first nine months of the year. While this makes the United States only China’s 15th biggest supplier, it represents a staggering 880 percent increase on the same period in 2016. Other non-traditional suppliers to China have also been making inroads as OPEC and its allies acted to curb output. Imports from Malaysia are up 500 percent, those from Britain by 95 percent and from the Republic of Congo by 459 percent. In contrast, former top supplier Saudi Arabia has seen a drop of 0.6 percent in the first nine months of the year compared to the same period in 2016. China’s imports from Iran are up by a modest 4.2 percent, while those from Iraq are 5.8 percent higher, both figures well below the overall increase of 12.2 percent in crude imports in the first three quarters of the year. What the Chinese customs and the vessel-tracking data show is that the ongoing discount of WTI to Brent, coupled with the output restrictions by OPEC and its allies, are creating new market dynamics in Asia. The problem for OPEC and other major crude suppliers to the world’s top importing region is that once market share is surrendered, it may prove difficult to win back. This entry was tagged Asia, crude oil, Google Alerts, OPEC, U.S. crude oil, WTI. Bookmark the permalink.